The 223-unit Houston Heights Tower for seniors has been renovated. HOUSTON – Houston Heights Tower, an eight-story seniors living facility on the walk-able 19th Street strip known as the downtown of the Heights, has completed a $12 million renovation. 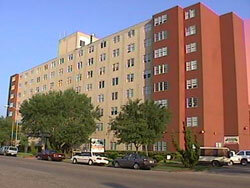 The 223-unit facility which opened in 1975, serves low- to moderate-income senior adults. The renovation was designed by Jim Gwin Architects. Comanche Contractors was the general contractor. “When we built Houston Heights Tower 42 years ago, The Heights was somewhat of a sleepy historic Houston neighborhood. Today, this is a truly vibrant high opportunity area that’s abuzz with retail, banks, restaurants, and medical facilities,” said Tom Forrester Lord, president of The Housing Corporation of Greater Houston. The City of Houston Housing and Community Development Department and Community Bank of Texas funded the redevelopment of the building, 330 West 19th Street. The building has 167 studios, 56 one-bedroom apartments and one two-bedroom apartment. Rents range from $435 to $566 per month, including utilities, estimated at 40 percent below market rate. Residents must be age 62 or older, active/independent and earn not more than 60 percent of the Houston area’s median income, which, for a two-person household is $33,240 annually and one-person household, $29,100 annually. Houston Heights Tower was developed by a consortium led by four Heights churches: Heights Presbyterian, St. Andrew’s Episcopal, Heights Christian Church and All Saints Catholic. The idea was to provide a place for neighborhood seniors to retire and stay in The Heights. Previous: Houston’s Quirky Elevated Buildings: Can “Stilts” Make a Comeback in the Inner Loop?